I own a DR Q original from the 70's, that's stunning on a guitar ! Straight to a Silverface Fender : approved ! can not find 50nF. Have lots of 47nF caps. Could they be used instead without major changes in sound? Yup. Those will work just fine. The two 50n caps from Q1 collector should be 5n. That could be it. I'll swap those values to correct ones right away. I don't see anything else wrong in there..
You think that would make such a dramatic difference? I just went over jack ormans schematic and noticed those before you commented, Also I only had a 30K trim. With 10 times the value - could be. 30K shouldn't affect it though. so changing the 5n caps in now give me a seemly normal guitar signal, but it seems the signal come from the diode section isn't functioning. Yeah that's Jack Orman's schematic I believe. The layout for all intents and purposes appears to be correct, So I wonder if the schematic is verified. I've run my hobby blade through the spaces so many times. I'm getting 8.25v on pin 1 and ~7V on pin 2 and 8.7 on Pin 8. The Pins 1 and 2 seem a little high don't they? I though pretty much every pin in most effects is roughly 1/2 the V+ pin (with exception of the ones connected to ground . I've tried pulling the OPAMP and placing the multimeter on just the socket and there is no voltage there so it's not a bridge. I've also tried various OPAMPS and they all get the same readings. Based on the Dr Quack scheme I would assume that the Stock DR Q must be verified,as there are only little differences. I guess I'll probably just have to start over as everything seems fine in my build. Here are multiple pictures of the build for troubleshooting. Some are fairly nice to see if I missed anything. Hmmm.. What's that 3 resistor stack? Seems like you have three different resistors to make 2.2M, but they are in parallel - meaning that the resistance is 152K. You need to take them in series to make 2.2M. Well using a 1458 and fixing the 2M resistor didn't resolve it. In the envelope follower section where should I be hearing audio? If anywhere? I took a look at the photo's and everything seems correct, the only thing I can't see is if you've put the second double link in under the IC socket, I'm sure you have as the one above it is there. If anyone else builds it let me know. i have just finished this build, but i am having a problem with the effect working with other pedals. Would someone help me. 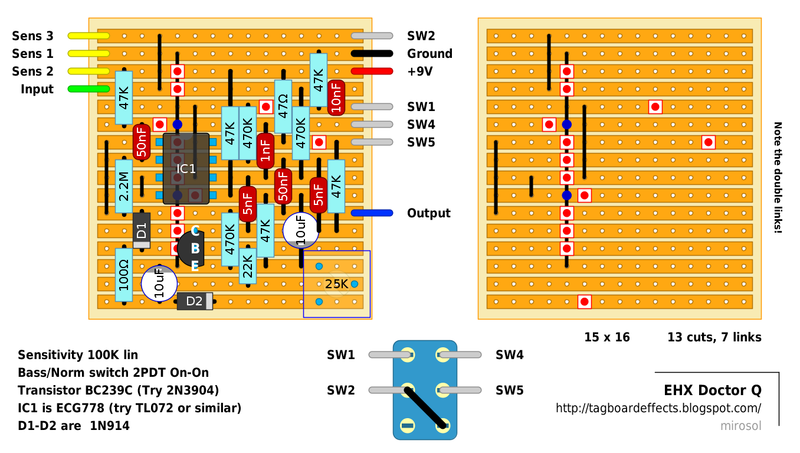 How different is this schematic from a Bassballs? Any chance of a layout for that? i used one of these live for years, people used to wonder how the hell i could get "wah wah" stuff going on the other side of the stage from my pedal board! imho, the key is to put dirt in front of it (or for more fun, dirt and then a compressor with the sustain pegged... the fuzz will make the comp swell, and as the comp swells, it will sweep the filter...sounds like a synthesizer, try it!!) and use your volume knob on your strat (what? ya don't play a strat?!?!?! ;) )or whatever to sweep in or out.. you can adjust your sensitivity from your guitar. if ya need more wah, turn it up or down til it does what ya want.. the fuzz will help minimize the volume changes, but totally affect the tone. i've always wanted another one, was a little sheepish about doing a vero..
thanks miro, now i can build another! hmmm, shoulda read the comments i guess, all the way! if it needs a 1458, it needs a 1458... regular opamps don't seem able to replace them. i may still give this a go..miro, can you please post a link to the schemo you laid this out from? Yup. The 1458 doesn't usually need so gentle biasing, so it may be good choice here. Hadn't have the interest to tackle this one myself yet, as the Nurse Quacky board works for me.. I just finished this, tested with several different opamps. TL072 and JRC4558 do basically nothing, LM1458 sounds good, but NE5532 was the magic one here. Sounds fantastic now. So this worked? Cool. Should this be tagged? Yes, tag it :P Extremely IC dependant. Tried too with a MC1458. So it seems that the 1458 family works, and the NE5532 too. Don't forget that the 1458 is noisy, but I like its sound more than the NE, is a matter of taste. Now I'm at work and can't take a closer look, but it should need some fine tunning with the trim, mayble a multiturn could be useful, as the sweet spot seems really tiny. Thanks for the input and work Javi! Don't really get what the issue was with earlier attempts... I'll tag it! You're welcome :) Who knows.... using the 1458 really works, but something stupid like placing backwards a damned diode has stopped me for two hours.... so... anything can happpen. It really doesn't work with TL072, 4558, and some others, that's for sure. But using the correct ic (and not placing wrong the diodes :) works with no problem. Well, it's not working. I spend several hours troubleshooting but found nothing. I know it's verified but...is it? That's asked quite a lot and every single time the verified layout has been fine and there was a problem with the build. Are you using one of the recommended ICs? Post your IC and transistor voltages and we can compare to a working build to see where your problem seems to lie. Hi Mark, I'm having problems too here... Using bass, I've got decent volume yet the effect is really poor. I can only really hear something by finding that verrrry small sweet spot in the trim and pushing the sensivity to max, and even then the wah is nowhere near as strong as it should be. I'm using a LM1458, and only other changes are a 30k trim, 47nF instead of 50, and doubled two 2,2n in parallel to get near 5n. Would that be the source of the problem? I've got gutshots if you need them, if so how can I send them to you? I'm new here. works but very low effect, any tips? Hi, I'm new in the DIY world. What is the 25k pot used for? it's a trimmer. a small onboard potentiometer that helps you to "tune" the board so you can get out the best sound of the effect. it's something that you have to set ones and then never use it again.i've also build this and it's a spot when you turn this trimmer that gave me the best results, so i kept it there and boxed it. Hey guys, is there a way to get rid of the switch? 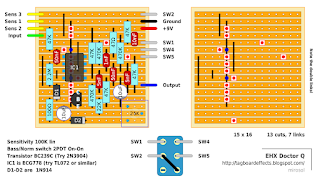 I was thinking of soldering a bridge between the sw1 and sw5 point on the board, would that work? The other thing I read at the nurse Quaky is that if I change the 2.2mohm resistor to 3.3m would strengthen the envelope signal. Am I correct? If anyone could help , I would appreciate it. I built this pedal and by itself(no other effects connected) it is awesome. But when I hook up other effects( bypassed or buffered) it takes all of the quack out of it. I have put the Dr.q at all locations in my board with the same results. I have tried to tweek the trimmer while it was in the chain to get the quack back, but I end up getting a high squeal or oscillation. Any help would be great. The ICs arrived today, tried the 5532, not much good, put the 1458 in and it worked in a sense. It doesn't sound anything much like the demo though, really, much more distorted.